If you love lasagna and pizza (and who doesn’t? 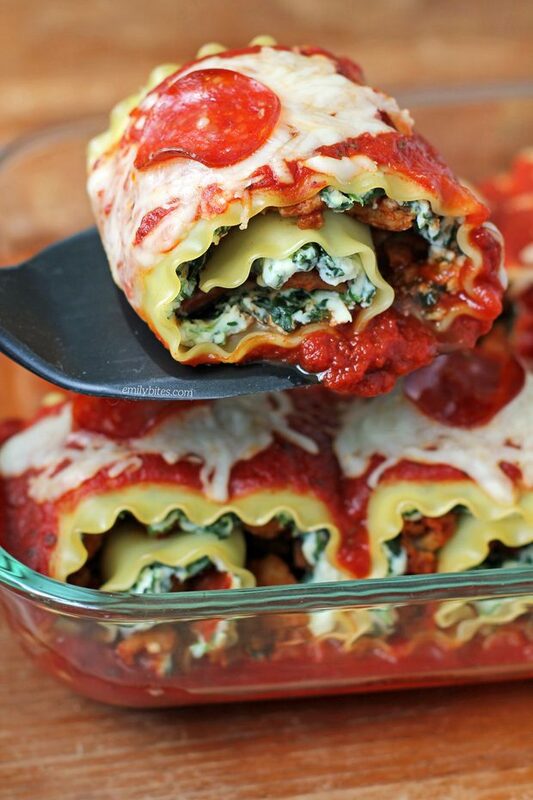 ), you’re going to adore these Pizza Lasagna Roll-Ups! 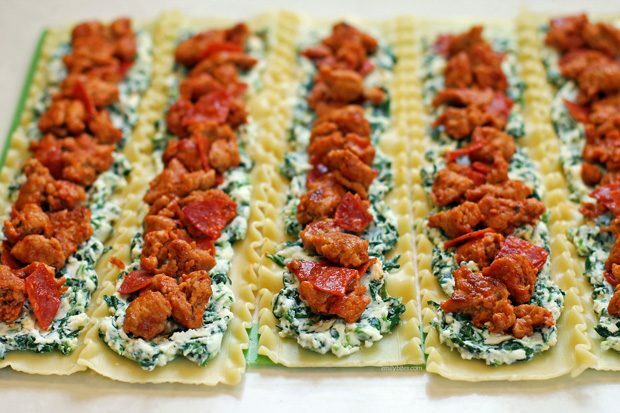 Ricotta, spinach, pepperoni and spicy Italian sausage all rolled up in perfectly portioned lasagna noodles and covered with seasoned tomato sauce and Mozzarella cheese – what’s not to love? This is also a great way to sneak spinach in for any families with picky eaters. 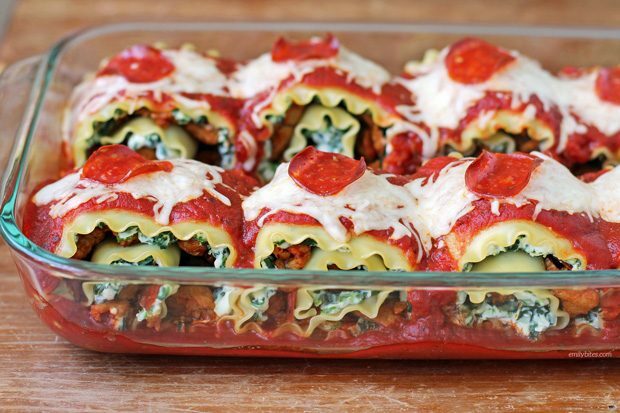 Better still, each of these Pizza Lasagna Roll-Ups is super filling and just 289 calories or 7 Weight Watchers SmartPoints! 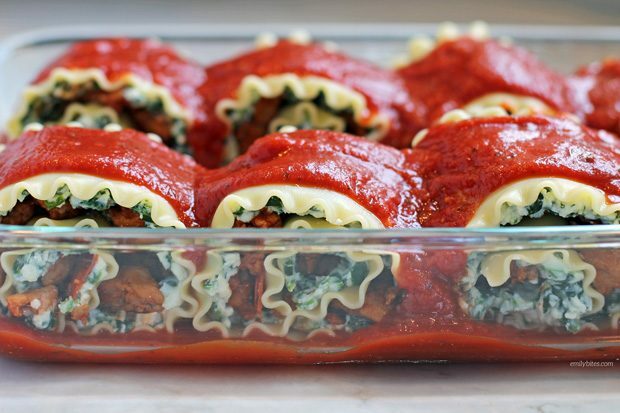 If you’re intrigued by the Lasagna Roll-Ups but not in the mood for Italian, check out my recipes for Spinach and Artichoke Lasagna Roll-Ups, Buffalo Chicken Lasagna Roll-Ups or Mexican Lasagna Roll-Ups! Since these recipes have a few steps and a 40 minute cook time, they take a little bit more time start-to-finish than some of my other recipes. They’re all very simple to put together though! You may want to make these Lasagna Roll-Ups on a weekend or a weeknight when you’re not in a rush. In the mood for more lightened up Italian-inspired recipes? Check out my Sausage and Tortellini Tomato Soup, Bruschetta Topped Balsamic Chicken, Pepperoni Pizza Salad, Chicken Parmesan Stuffed Shells, Antipasto Salad, Caprese Wonton Bites, Sausage and Ricotta Pizza, Sausage Stuffed Portobello Mushrooms, Beef and Sausage Manicotti, Pizza Wonton Cups, Antipasto Chicken Roulades, Zuppa Toscana, Easy Garlic Knots, Eggplant Parmesan Casserole, Chicken Milanese, Pizza Pockets, Caprese Tarts, Chicken Pesto Flatbreads, Chicken Parmesan Quinoa Bake, Italian Wedding Soup, Sausage Tortellini Skillet, Bubble Up Pizza Casserole, Spaghetti Pie, Spaghetti and Meatball Soup, Slow Cooker Meatballs and Marinara, Chicken Parmesan Wonton Cupcakes, Slow Cooker Beef Braciole, Pizza Logs, Chocolate Chip Cannoli Cups, Caprese Dip, Chicken Piccata and many more in the Italian section of my recipe index! Boil and salt a large pot of water and cook lasagna noodles according to package instructions. Drain and rinse with cold water. Lay noodles flat on a clean dry surface and set aside. In a mixing bowl, combine the tomato sauce, pizza sauce and Italian seasoning and stir together. Set aside. Place the sausage in a large skillet over medium heat and cook until browned, breaking the meat up into small pieces as it cooks. When the sausage is cooked through, add the chopped pepperoni and 1/3 cup of the tomato sauce mixture and stir to combine. Remove from heat. In a mixing bowl, combine the ricotta cheese, spinach and egg and stir until well combined. Spoon 1/3 cup of the cheese mixture onto each lasagna noodle and spread across the surface leaving a little room (about ½”) at the far end with no toppings. Top the cheese layer on each noodle with the meat mixture from step four, evenly dividing the meat between the noodles. Starting with one end (not the one with space at the end), roll the noodle over the filling until it becomes a complete roll. Repeat with all noodles. Spoon ½ cup of the tomato sauce mixture into the prepared baking dish and spread across the bottom. Place the lasagna rolls seam down in the dish and spoon or pour the remaining sauce over top. Sprinkle the Mozzarella over the top of the rolls and place a pepperoni on each one. Cover the dish with aluminum foil and bake for 40 minutes. These look yummy! Does one piece equal one serving? I want to make these, they look delicious, but I’m only cooking for 2 people. Do you think they I could freeze the extras before cooking? My son and I made this tonight, it was DELICIOUS! He ate 4 & 1/2!! (he’s 14!) I ate 1 & 1/2 and still stayed within my points! I made these yesterday! They were delicious. Thank you for sharing. I made this over the weekend as a “make-ahead” meal. I baked them off a couple of days later. These are delicious! Definitely a keeper! OMG!! These were absolutely wonderful…and, fun to make. I can’t wait to try the other variations of roll-ups on your site. I will be making these again, and again! Just made these for lunch for company. They were excellent.